SALEM — A pastor who was expelled from his denomination for forming close friendships with witches took issue on Thursday with a number of evangelists who were preaching repentance on the streets of the Halloween capital of the world. Phil Wyman and his group “The Gathering” have been attending Halloween celebrations in Salem for nearly a decade, providing live music, hot chocolate and various readings on the popular Essex Street in Salem, Massachusetts. Salem, known as “Witch City,” was the location of the Salem Witch Trials of 1692 and has a long history of witchcraft and paganism that continues to this day. Because of Salem’s roots, the city hosts a month-long celebration of Halloween each year called “Haunted Happenings.” The events include a costume parade, witch-centered dramas, psychic readings and public fairs and carnivals. 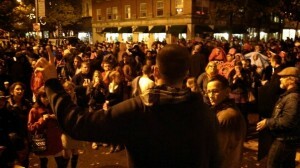 On Halloween, the streets of Salem become especially congested with trick-or-treaters and other costumed revelers—numbering upwards in the tens of thousands. A number of occult shops are especially visible during the month of October as well. He said that he wanted to make peace with the witches and to converse about matters of spirituality. But according to an article from the Salem Patch, Wyman does not necessarily seek to convert pagans. During an interview earlier this year on “Live From the Bay With Joey,” Wyman explained that during one Halloween celebration, he ran a confessional booth that was frequented by 35-40 area witches and pagans. In 2005, area pastors became concerned that Wyman was getting too close to the witches in the city. Wyman’s district supervisor sent him a letter, outlining that his actions went too far. Wyman was summoned to appear at a denominational hearing that year, and was expelled the following March. That was seven years ago. To this day, Wyman continues formulate friendships with witches and pagans in Salem, and makes it a point to be at Haunted Happenings each year to put a charismatic twist on the celebration. 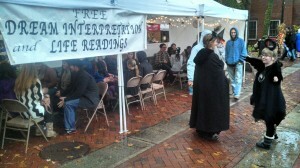 On Thursday, Wyman and other volunteers with “The Gathering” were on the streets of Salem offering destiny and tattoo readings, dream interpretations, father or mother blessings and healing prayers to Halloween revelers. Wyman also was responsible for “Fountain Stage,” which featured a variety of Halloween entertainment, including American Idol contestant Angie Miller, the daughter of Pastor Guy and Tana Miller of Remix Church in Salem. Other bands included the Tokyo Tramps, Mamadou Diop and One Hot Mess. Jim MacPherson preaches to the crowds in Salem. But Wyman also took issue with a number of evangelists who were on the street calling men to repentance and faith in Jesus Christ. During his interview on “Live From the Bay,” he explained that it is his custom to send men dressed in monk costumes to chastise street preachers and put distance between them and the area witches. “When street preachers were harassing them, and somebody would call and say, ‘Help Pastor Phil, there’s all these wild street preachers out here and they’re [verbally] attacking our psychic fair,’ we’d send people dressed up as monks to stand between the situation,” he said. On Thursday, Wyman again sent a monk to chastise evangelists preaching on the street. Christians who witnessed the exchange noted that the man became extremely angry—to the point that he was shaking–and the crowd eventually turned against him. 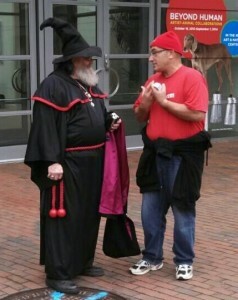 Mike Stockwell witnesses to a male witch, or warlock, on the streets. Bishop, who has been preaching at Haunted Happenings for the past six years, said that he observed the monk, who was visibly “full of hate in his heart,” spewing profanity at a 14-year-old last year. He stated that Wyman’s congregants often support the crowds for their rejection of the preaching. Bishop, who attended the event as a participant for many years before becoming a Christian, says that his only motive in preaching on the streets is his love for the people. Bishop remarked that Wyman is presenting a “false love” in defending the witches. He says that he prays for Wyman and the costumed monk on a regular basis, and hopes that they will come to understand Biblical evangelism.